One of the main reasons you may want to add a fence to your home property is for the benefit of your furry four-legged friends. You want to be able to keep your dog safe and happy inside your fence, while keeping out intruders and other pesky animals. There are many options when it comes to installing dog-friendly fencing, but the best way to keep your dog safe is with a solid and sturdy physical barrier. There are many options when it comes to installing dog-friendly fencing, but the best way to keep your dog safe is with a solid and sturdy physical barrier. One of your top concerns when building a fence for your dog may be their ability to dig under or jump over it. To prevent your dog from digging under, you will simply need to bury the bottom of the fence several inches in the ground, or fill in the perimeter of the fence with concrete. 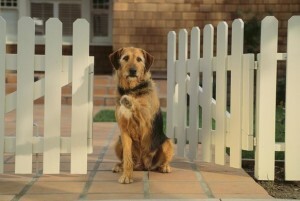 When you’re choosing a fence, consider one high enough to prevent or discourage your dog from jumping out. Many dog owners choose a six foot privacy fence for maximum safety. Chain link is one of the most economical and budget-friendly fencing materials. It’s long-lasting and durable as well. However, one of the downfalls of using it as dog fencing is that it allows the dog to view the temptations in the outside world and gives your dog convenient footholds if he or she is a good climber. Wood is easy to install, provides a sight barrier, and usually lasts 15 years or longer. However, loose pickets are always possible and strong, large dogs are capable of dislodging them. Reinforced wooden fences are more expensive, but hold up better to those dogs who tend to be extremely determined. Vinyl offers a sleek modern look and is becoming more and more popular with homeowners. Vinyl is more durable, requires less maintenance, and provides higher security than wood, but is more costly. Solid panels will provide a sight barrier for your dog as well. If you decide to go with split rail, you will need to line it with sturdy chicken wire or fencing fabric so that your dog cannot slip through. However, it is affordable and scenic and a great choice for those who have dogs that aren’t especially prone to escaping. This entry was posted on Thursday, August 6th, 2015 at 5:16 pm. Both comments and pings are currently closed.